Superman finds Jimmy's dead body and panics. Over at STAR Labs, Batman is investigating the theft of a supply of kryptonite on which the scientists were experimenting to determine its conceivably beneficial-to-humanity properties. Superman arrives, panicked, begging Batman for help because he can't see Lois. Batman alerts the Justice League - Green Arrow, Cyborg, Wonder Woman, The Flash. Searching areas of Metropolis that Superman can't immediately see while airborne, Flash finds the corpse of The Scarecrow, murdered by the Joker. Wonder Woman discovers at the docks that the Joker has hijacked a submarine. Superman is on it. He apprehends and promptly beaches the submarine before storming in, where he finds the Joker and Harley Quinn in the infirmary with Lois strapped to an operating table, a scalpel in the Joker's hand and gas masks on both his and Harley's faces. But Superman doesn't notice the green mist until it's too late. Also, the Joker and Harley Quinn aren't alone. 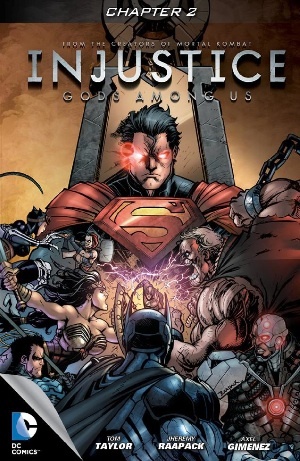 Story - 4: So it's clear now that these first few issues (at least) are going to be short on details pertaining to the final series of events that turns Superman into whatever kind of dictator he's going to have turned into and long on rolling out the DC Universe cast of characters. Fair enough. You gotta pace the thing and, if it's me, I don't push our boy over the edge until the week the game comes out. Crassly commercial, or what? Heh. Also, by doing this, it sets up the strong possibility that Superman will be pushed over the edge not just by the mere death of Lois and/or unborn child (a matter that has been proven to stoke intense feeling in some fans, as well it probably should) but by the manner in which it happens (still assuming that it does happen, which I think it almost certainly will) and, likely, by who ends up doing it, which possibilities I hadn't before considered. So yeah - this issue is about what I expected; indeed, I don't anticipate we reach the crest of Superman's arc for a while. I will nitpick on a couple of things - Superman's initial panic is a tad overwrought, I think, with "I can't see Lois" in particular too much the weak sauce of the kid in that Daredevil movie saying the exact same thing when his father dies. In both cases, the line is tainted by having been in that Daredevil movie. (Ha!) And why the semi-dramatic/-mysterious half-silence from Batman on identifying Lois to the League - from "don't worry about it" to "she's one of us" to "Lois Lane" in a continuity where Lois and Clark are clearly cohabitating (if they're not actually married) and, thus, where Lois would (come on) almost certainly be known, and known well, to them all? Just awkward and weird. Overall, though, this thing continues to hold my attention. Art - 4: Still liking the art, though I wonder whether it's because duties were shared on this issue that we have a bit of variance in some of the faces, especially Superman's when he first arrives at the submarine. LOVED Joker's one cocked eye when Supes barges in on him, though, and overall the panels are well, if not altogether originally, framed. Good work, but down a notch from first issue.